Here’s the extended backing track to my lesson on the Locrian mode. It’s quite a good mode to use if you’re after a very dark, satanic sound. The Locrian mode is the 7th mode of the major scale. This means that, although the track uses D Locrian, it’s the same notes as E flat major. The only difference is that the ‘root note’ is now D.
This gives us a minor 3rd (D to F),a minor 6th (D to B flat) a minor 7th (D to C)- just like the natural minor scale. It also has a flat 2nd, the same as the phrygian mode. The thing that makes this mode stand out from the others is that it has a diminished 5th. So, instead of your regular D to A, we have an A flat in this scale. This is the interval used by Black Sabbath in the riff to the song ‘Black Sabbath’. Needless to say, it’s very, very dark sounding! This backing track is divided up into three sections, each of which has a slightly different feel. Because of the chords used, you have a slightly different choice of scales for each section. Although, don’t forget that this is going to sound dissonant, no matter what! The track begins with some powerchord ‘hits’. 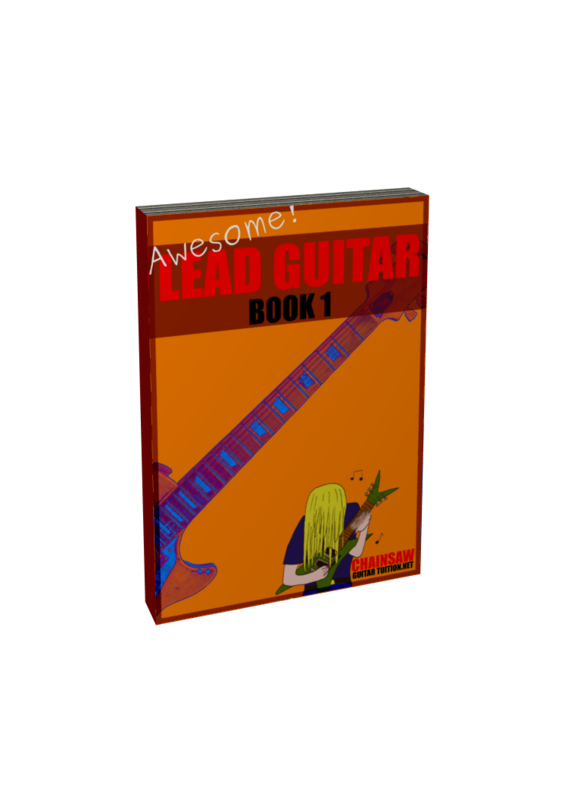 For these, the guitar actually plays a standard D5 chord (thickest three strings in Drop D tuning- D A D). The thing that makes this section sound ‘Locrian’ is the guitar harmony. This harmony uses both the flat 2nd (E flat), and the flat 5th (A flat)- two notes that really show off the sound of this mode! Because this riff is strongly in the locrian mode, there are less choices to use when playing over it. 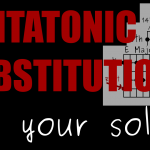 The two pentatonic scales that I’ve included above will work because of something called ‘pentatonic substitution’. It just so happens that the G minor pentatonic contains 5 notes that are also part of the D Locrian mode. Just remember that your root note is still a D! 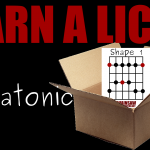 The D minor pentatonic will work because the Locrian mode has a minor third- so essentially it’s a minor scale. 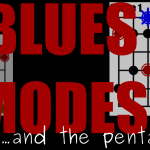 Sometimes the A in D minor pentatonic will clash with the A flat in the mode…but this won’t happen often. Now, this is where things get interesting! The chord here is just a tritone (literally just the notes D and A flat), which means you can use any scale with a diminished, or half diminished chord. For example, the second chord of the harmonic minor scale is diminished. 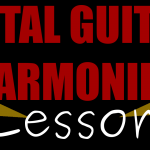 This means that you can use the harmonic minor scale that’s two frets down (towards the head). If we’re on the D (10th fret; E string) for the locrian mode, we can then use the C harmonic minor scale (first shape from the 8th fret; E string). I didn’t find the D natural minor scale to work too well here, because it doesn’t have a flat second. However, the D phrygian mode will sound great! When playing over this section, listen to the rhythm of the chords underneath. Sometimes you can use some of these rhythms to create cool lead parts. The notes in the chord are D and A flat, which are exactly three tones apart (or 6 frets along one string). If you continue this pattern and go 6 frets up from A flat, you get to a D note. This is important, because it means that we can turn the chord upside-down, without changing it. It also means that you can see either the D or the A flat as the root note. Therefore, you could- in theory- try using A flat locrian over the same chord…but I’ll leave it up to you to experiment! The third section uses tremolo harmonies- which is something you might get in a black metal song. This part probably sounds the most demonic out of the whole track. 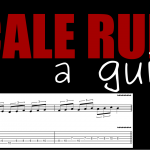 You can try any of the scales above for this section, but I recommend being more melodic. That’s why I’ve used arpeggios and sweep picking in my original solo to this track. Again, you can find the original lesson for this more here.